I'm up to 9 dishcloths for the year, which is well ahead of schedule. Nothing really very exciting or new. I have an easy pattern all written up and I'm going to link it here and eventually get it uploaded to Ravelry. It hasn't been tested or tech edited but it's more of an idea than a true pattern. I've been working on a few different things the last month. I took a brioche class and then figured out how to make a brioche dishcloth. I'm using some reclaimed yarn and I wasn't sure what needle size to use or how many stitches I might need to cast on so I just picked some needles and cast on 30 stitches and hoped for the best. Things were going well until I started having doubts about the size and gauge. 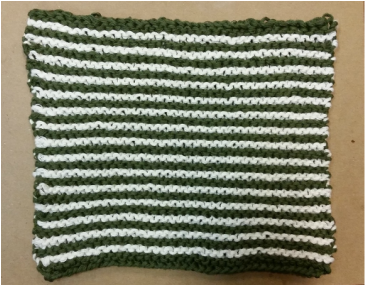 Its pretty loose for a dishcloth and it seemed really wide. I thought it would be fine though, especially if I wasn't going to give it as a gift. Then, 4 inches later, I went to pull it out of my bag and I yanked the needles out and some stitches came loose. I tried tinking back a row but I couldn't get these last few stitches right. Sicne I don't like how the fabric is turning out anyways, I'm going to rip it out and try again. 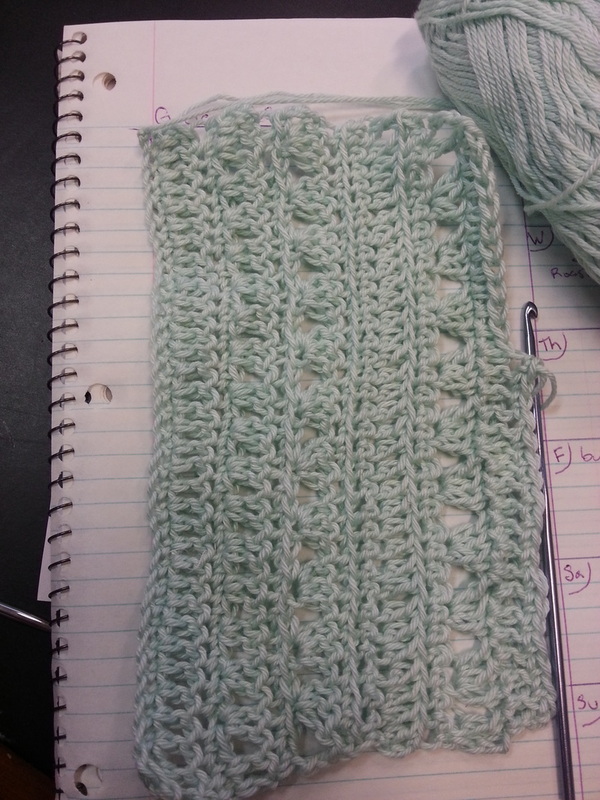 I think my next try will be on smaller needles and I think I need a garter stitch edge to make it look neater. The next new thing I've been working on is a crochet dishcloth. I'm using some of the basic stitches randomly to get some practice. I'm getting some wonky edges but I think it looks nice. I'm going to look at some crochet youtube videos to figure out where I'm going wrong at the ends or beginnings of my rows. I don't always know where my first or last stitch is supposed to be. Week one is done and I got 2 dishcloths finished! Both of these are being sent to a wonderful person as part of a swap and I hope they like them. The second one I forgot to get a picture of once it was finished but I just did a few more rows in pattern and then ended in garter stitch. I used reclaimed yarn leftover from when I closed by etsy shop. I've used it in other dishcloths and it has held up really well. I have a ton of this yarn and two dishcloths hardly made a dent in it. 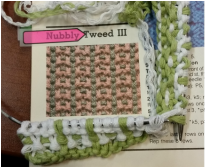 I attempted the nubbly tweed pattern and I loved how the right side looked but the wrong side was terrible. I don't mind having a dishcloths that aren't reversible but it just wasn't working for me. I think it would be fun on the leg of a sock though. 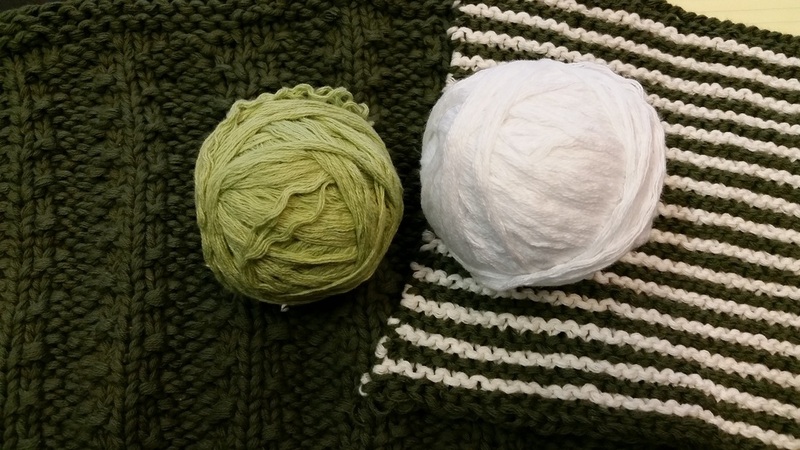 Up next: I think I'm going to try some other sort of color work with the same light green and white that was used for the nubbly tweed attempt. 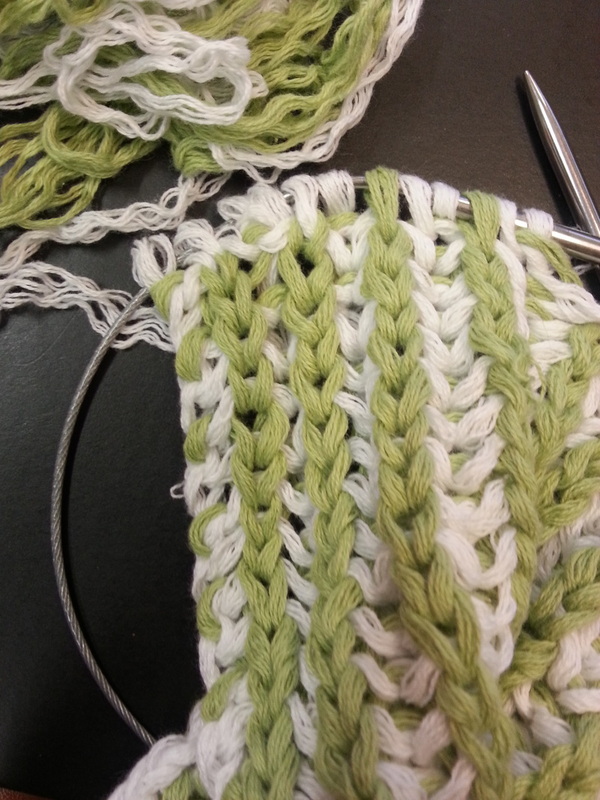 I'm taking a brioche class next week so maybe I'll do two color brioche knit flat? Maybe stripes with slipped stitches? Mosaic? I'm going to keep working on my socks while I decide.